BikeCAD displays the Saddle tip to brake hood measurement in two forms: Direct and Projected. These dimensions are illustrated above. 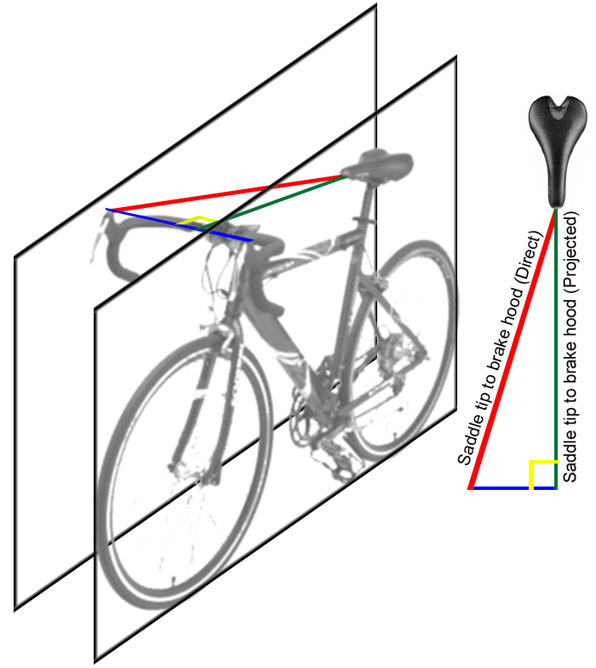 The direct distance is displayed in BikeCAD with an * symbol to denote the fact that the dimension is actually a 3D dimension which takes into account the width of the handlebars. The projected distance is the direct distance projected onto the plane of the screen. These dimensions are found in the Dimensions dialog box under Components >> General. Spoke lengths are another example of dimensions which are shown with * to represent their actual 3D lengths.